On Sale Now! 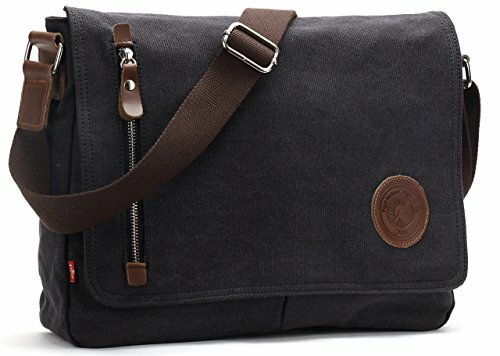 Save 9% on the Magictodoor 13.5'' Vintage Canvas Messenger Bag Black by Magictodoor at Luxury Bags Sale Store. MPN: 8501hei. Hurry! Limited time offer. Offer valid only while supplies last. Key Features: 1. Color: Black & Coffee; Material: high quality canvas & leather, waterproof and scratch-resistant; Lining: cotton cloth. 2. 1. Color: Black & Coffee; Material: high quality canvas & leather, waterproof and scratch-resistant; Lining: cotton cloth. 3. Various pockets: Exterior: 1 zipper pocket and 2 open pockets in front; Interior: 1 main compartment, 2 drop case for cards and phones. 4. With detachable and adjustable shoulder straps for comfortable wearing, no compression feeling. 5. It's a very good bag for working, short traveling, school and daily using. 6. Please allow little color difference due to different camera or light environment. Dimensions size: 13.5"(L) * 3.1"(W) * 10.8"(H), Not fit for a 15 inch or a 14 inch laptop, 13 inches laptop will be suitable. There may be some white spots on the black canvas cloth. BUT hope you can understand that the material is made of washable canvas. Please allow a little color difference. - Wash Separetely to avoid staining. Size: 13.5"(L)*3.1"(W)*10.8"(H); Weight: 1.45 lb; fit for 13 inches laptop or A4 documents. Various pockets: Exterior: 1 zipper pocket and 2 open pockets in front; Interior: 1 main compartment, 2 drop case for cards and phones. Perfect bag for working, short traveling, school and daily using. If you have any questions about this product by Magictodoor, contact us by completing and submitting the form below. If you are looking for a specif part number, please include it with your message.